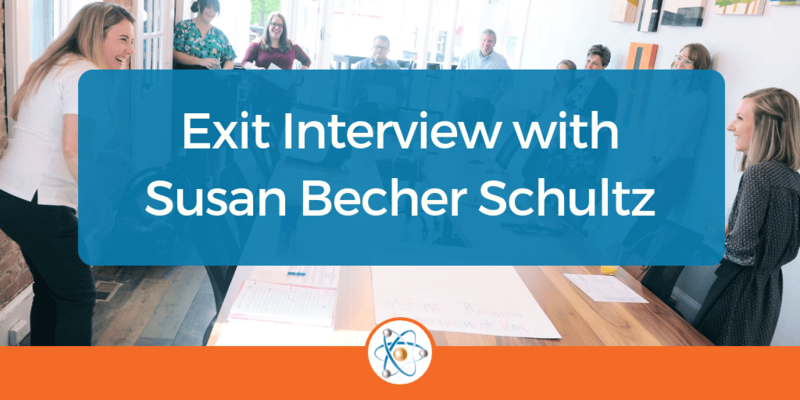 Since Atomic Revenue’s humble beginnings in 2014, Susan Becher Schultz has helped set the foundation for company success. Five years ago she sat at our CEO’s dining room table and helped to put key tools and systems in place that continue to play important roles in company operations today. Through the years Susan has evolved from the CEO’s personal assistant to Chief of Staff responsible for training new employees, organizing team events, coordinating client projects, creating content, distributing content by email campaigns and social media, and providing tools for team efficiency and success. Susan was gracious enough to answer a few questions for us while transitioning into her new role outside of Atomic Revenue. What did you enjoy most about your role as Chief of Staff with Atomic Revenue? SBS: What I enjoyed most about my role with Atomic Revenue was working alongside my team members. So often in business settings, companies are bogged down with the minutiae, the protocols, the strategies, never-ending task lists, the daily grind, etc. It’s so common among employees to feel like their work doesn’t matter because ultimately the end vision isn’t their own. Atomic Revenue expects self-directed, wicked smart problem-solvers to own their work. It was my pleasure to work one-on-one directly with team members to make sure they had all the tools they needed to do their best work. The team knew that I could help them and that Atomic Revenue understands everyone is human and respected as such. I always felt honored when a team member would let me know they felt they could be themselves around me and take off their professional mask – it’s my hope to continue to be that person for others as I move on in my career. What would you say are some of the most important skills or lessons you learned during your time with Atomic Revenue? Also – I’m a content marketing pro thanks to working with Steph Nissen and I have to say I feel like I got paid to go to grad school for as much as I learned from her! How did your time as Chief of Staff at Atomic Revenue prepare you for your new role? SBS: I’ll be taking on a Communications role in my new job – most of my digital communications skill set was learned during my time at Atomic Revenue. I now feel fully confident to set them up with a modern website, social media strategy, email campaigns as well as will be able to bridge the gaps in their internal communication all because of my time spent at Atomic Revenue. I’m actually strangely thrilled their communications is a mess, I know I’m the right person to solve their problems. I’ve never felt more prepared for a job in my life! We wish Susan the best of luck and much success in her new role and thank her for all of the hard work and dedication she gave during her time with Atomic Revenue!